Durability. Craftsmanship. Distinction. These principles are not achieved overnight. 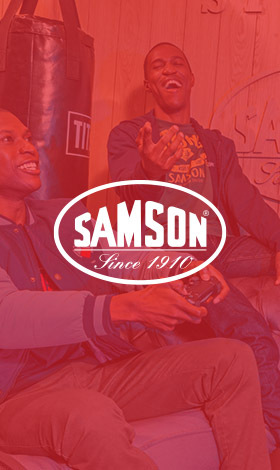 At 107 years old, Samson is an established brand whose clothing strength is interwoven with South Africa’s history and culture. The Samson blue overall was the iconic workwear for those who worked hard to overcome personal obstacles. With the increasing hunger for authenticity among young South Africans, the brand has evolved over time and includes a core range of workwear-inspired apparel has extended into major street fashion. The range includes boiler suits and shorts, carpenter style trousers, kitchen suits and dungarees with an authentic African aesthetic. THAT MAN PTY LTD E.L.